Member of Korean girl group T-ara, Ham Eun Jung made public her white, beautiful and delicate photos without makeup days before, and receiving a large number of praises and caring from netizens. On December 7th, 2011, Ham Eun Jung posted on her personal Twitter, “The leisure time for drinking, although have to go out at 3 am but very happy, what is this,” and at the same time uploaded photos. 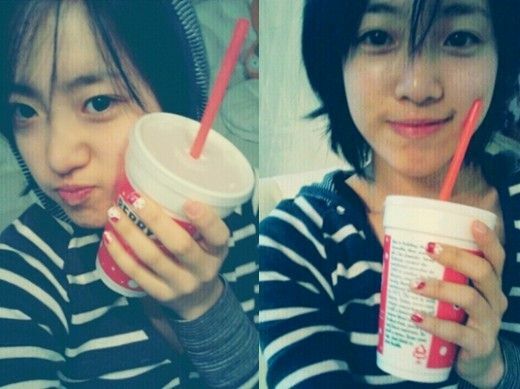 In the photos, Ham Eun Jung was without makeup and was holding a drink, showing her side of cuteness and innocent. But her face without any makeup looked a little tired, as she should be busy with filming and various activities. Internet users left messages one after another, “No makeup is still beautiful,” “Looks slightly tired, but seeing the effort it’s good,” “Watching Queen Insoo now, must put on steam for the fans,” and other responses that support Ham Eun Jung. Ham Eun Jung is playing the role of Queen Insoo during her young age in JTBC’s hit drama Queen Insoo.